CO-OP Financial Services is partnering with OpenIDEO and MasterCard to bring design thinking, collaboration and ultimately transformative innovation into credit unions nationwide, delivering on the industry mission of “people helping people". Join the Credit Union Innovation Lab: an online community of credit unions, members and future members, collaborating to innovate and humanize financial services for all. Tailored specifically for credit unions — join a space to share what you’ve learned, apply ideas from experts in human-centered design from diverse fields, and work together to think forward. Discover an opportunity to gain useful insights from prospective members, to understand who they are and discover what motivates them. Realize the credit union mission of people helping people through collaborative projects and knowledge sharing. Credit Union Innovation Fellows are a select group of leading innovators in the credit union industry who are re-igniting the credit union innovation movement. They are leaders and visionaries in their teams, who often made roles for themselves because they identify needs and develop solutions going beyond their job description expectations. Fellows are truly committed to mission-driven financial services and to serving their members’ needs. Fellows are guided through a three month experience in which they learn design thinking and receive mentorship from world renowned social innovation platform OpenIDEO. 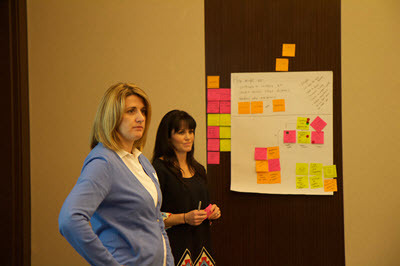 We believe that human-centered design can increase the impact that credit unions have on their communities. That is why we have designed the first toolkit for credit union intrapreneurs to embed human-centered design into their credit union. We know this is not an easy task, so we have also included tools on collaboration and getting buy in from peers and members while in this journey. Learn more about this project and meet some of the Credit Innovation Fellows already on board. Sign up below to receive updates about the Credit Union Lab initiative!